As Old As Time: A Twisted Tale (Twisted Tale, A) by Liz Braswell is on sale for $0.99 in ebook format down from its usual $9.99. I don't know how long the sale will last so don't dawdle if you're interested in it. This is a novelization of the Disney version of Beauty and the Beast. This is the third book in Braswell's series. She's also explored Sleeping Beauty in Once Upon a Dream: A Twisted Tale: A Twisted Tale and Aladdin in A Whole New World: A Twisted Tale. What if Belle's mother cursed the Beast? As Old as Time is the third book in a new YA line that reimagines classic Disney stories in surprising new ways. When Belle touches the Beast's enchanted rose, memories flood through Belle's mind—memories of a mother she thought she would never see again. And, stranger still, she sees that her mother is none other than the beautiful enchantress who cursed the castle and all its inhabitants. Shocked and confused, Belle and the Beast will have to unravel a dark mystery about their families that is 21 years in the making. Once Upon A Quest: 15 Tales of Adventure (Once Upon Series Book 3) is bargain priced in ebook format for $2.99. This is the third volume in the anthology series and features some well-known authors, like Alethea Kontis. It was just released last month. Once Upon A Curse: 17 Dark Faerie Tales (Once Upon Series) is bargain priced in ebook format for $.99. This is the first volume in the anthology series and features some well-known authors, like Alethea Kontis and Yasmine Galenorn. #1 Bestseller in Fantasy Anthologies and Dark Fantasy Seventeen magical stories from NY Times and USA Today bestsellers and award-winning authors that will entice you to the darker side of faerie tales. More Grimm than Disney, in this collection you’ll find twists on Snow White, Hansel & Gretel, Rumpelstiltskin, The Snow Queen, Cinderella, The Pied Piper, Alice in Wonderland, and Red Riding Hood, plus new tales paying homage to the old traditions. FAESCORNED by Jenna Elizabeth Johnson - The Morrigan, Celtic goddess of war and strife, must relive a painful memory that reminds her of what she can never have. What do you do when a site that is almost 20 years old with over 10,000 pages on it needs a redesign? You take FOREVER to make it happen. I've perfected procrastinating my procrastination of the work. 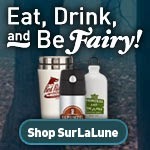 In the coming weeks, really and truly, the SurLaLune Fairy Tale site is receiving a makeover. It is long past due to become mobile responsive. It is time for a different look. The task has been daunting and will happen in phases. First and foremost, the annotated tales pages and the introduction materials are going to be launched with new looks. Old bookmarks will break, alas, although I am trying to insure we have redirects in place for the most popular pages especially. Aaron McMillian has been busily creating original illustrations for the banners on the pages. SurLaLune is going to look much more modern, rather a must with the programming needs for a mobile responsive site. His banner illustration for Bluebeard graces the top of this blog entry. It's been really fun to see what he's produced for tales like Maid Maleen and some others that so rarely get any treatment. He did a few tales for me at the beginning for fun and I fell so in love with his work that I asked for all 49 annotated tales to receive similar treatment. I'm not demanding or anything, but I really wanted a pretty new site and illustration is an art of which I can only ever be a great patron! I've also received help from Brett Hicks for the programming which is also lovely work but not as easy to appreciate with the eyes. Good programming is invisible to the average user because they are too busy enjoying the page content to notice. I'm not going it alone this time but that is still a small team for a big task. And it has to happen in the time when we don't have bigger clients who pay for our work since SurLaLune is still very much a non-profit (although not registered as such). If I depended on it to feed me, let alone the guys, we'd get Ramen noodles once a week after SurLaLune's overhead costs are accounted for. But this is my young adult child. Can't really call it is a baby when it is 20 years old, can I? And has defined the years of my adulthood since I started it when a young grad school student. It needed to get some grown-up clothes to wear out into the world again. The last redesign was 10 years ago. Time flies way too fast. When did I become middle-aged? After we get the redesign launched, I will be updating pages with new copy, books, etc., too. I have a long list. I tremble to think I may even get some of it done! On that note, I haven't even been able to muster the energy to look at the SurLaLune emails in at least six weeks. I've had to break in two new computers in that time. And as always, I have been working my real world job (which was not quieter during the last few months like it usually is which is good since I really like reading, food, clothes and shelter) and trying to complete two SurLaLune book titles that are nearly, nearly done. First is the second expanded edition of Sleeping Beauties: Sleeping Beauty and Snow White Tales From Around the World and the second is Diamonds and Toads: Tales of Kind and Unkind Girls From Around the World. Once Upon A Kiss: 17 Romantic Faerie Tales is bargain priced in ebook format for $.99. This is the second in the anthology series and features some well-known authors, like Alethea Kontis and Yasmine Galenorn. On the way to her wedding, brave and clever Princess Sabine falls into a Glass Mountain, where she is trapped with a crotchety man she calls “Old Rinkrank.” The two form a unique, unlikely friendship while working to escape. A young woman in ancient Greece is tasked with carving a new statue for Aphrodite's temple. But what happens when she falls in love with her art? Juliet enters the afterlife and discovers the truth behind her relationship with Romeo and Paris - and that their greatest challenge is yet to come. Aisling, a young Faelorehn artist, finds herself falling for the son of one of the famed Tuatha De Danann. The only problem is, she’s unaware of his true identity, and her selfish uncle will do anything to keep her from realizing her dreams. Sometimes, a prince isn’t as charming as history would like you to believe. And sometimes, a princess needs an alpha male shifter to find her happily ever after. An imp finds herself in a fairytale world without her infernal powers facing an impossible task. Will Sam barter away her firstborn? Will her angelic main-squeeze save her? Or will she come up with a devilish solution of her own? Star’s refusal of suitors lined up for her hand has her family in knots, but when the city is bombed and overthrown, she loses everything. After she’s rescued by a handsome stranger named Clyde, she sneaks away to save her parents but finds herself trapped in the new president’s clutches. Isabel Ivers’s stepfather will do anything to secure his place as Far North’s new ruler, even if it means marrying her off to the depraved prince of the lowlands. Despite fighting in countless battles to bring peace to warring kingdoms, Pynnelope, a warrior maiden made of wood, knows no fear. Becoming human is all she desires until she discovers she can have so much more. The Great Pursuit (Eurona Trilogy Book 2) by Wendy Higgins is on sale in ebook format TODAY ONLY for $1.99 when it is usually $9.99. This is the sequel to The Great Hunt, a book inspired by the Grimms' tale, "The Singing Bone."